The MBRAUN LABstar is a ready to operate workstation that includes a large main antechamber, vacuum pump and Siemens PLC touch screen display. The LABstar comes standard with an automatic regenerable oxygen and moisture single purifier unit (MB 10G compact) that can attain purity levels of less than one part per million oxygen and moisture. 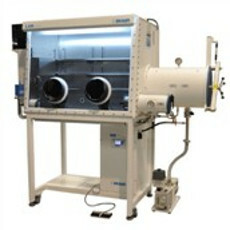 All MBRAUN gloveboxes regularly operate world-wide through the use of standard power supply. A well-designed, ergonomic lab workstation is an ideal fit for any laboratory. Find online auctions and classified ads for lab workstations on LabX.